Chrome Extensions for Dazzling Designs: Always experiencing the gargantuan urge to diagnose the defects of your website design? Well, most enlightened minds of Dubai feel the same way. Even if they notice a tiny blemish in their prized website designs, they go berserk until they dump the debacle. “Cactimedia a Web Design Company in Dubai” is geared up to wither away all the troubles of your website design by recommending classic Chrome Extension solutions for web design. Packing the chrome browser with exact extensions is a perfect ploy, as far as keeping the supportive design tools at your disposal is concerned. Here, we allow you a sneak peek into the list of Chrome extensions for design straight from the Chrome Web Store of technical giant Google. There exist diligent designer tools to discover the appropriate font, create your perfect palette of colors, bring out pristine images with tailor-made graphics, assess elements, and evaluate yours as well as your rival’s page. Cactimedia has always been a heedful hub, where all the best website design suggestions could be rendered. 1. 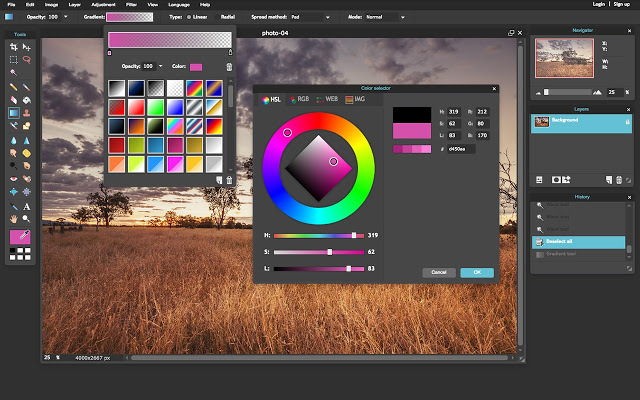 Pixlr Editor: It is an online photo editor which comes without a price tag. Even the need of downloading it never arises. The Pixlr editor packs a punch with its superior features, more often than not available only in desktop graphic design applications, which boasts of layers, lasso tool, brush controls, cloning and filters to name a few. 2. PicMonkey: The wonderful Chrome Extension allows the user to take hold of images right away from any web page and unlocks it in PicMonkey, an online photo editor that costs nothing. 3. ColorZilla: With ColorZilla in the kitty, you can now embrace a color reading from whichever point in the browser. Hurriedly, fine-tune the color, and then stick it into another program. 4. WhatFont: Puzzled about the font information of the text you have been clinging on? What font rolls out the perfect way to understand the font features of your text by sensing the services utilized or serving web fonts. It braces Typekit and Google Font API. 5. Evernote Web Clipper: Secure your web elements with the efficient Evernote extension into the Evernote account. Now you can insert and emphasize text, exploit visual callouts, share clips and enjoy much more features with this incredible extension. 6. Yslow: Yslow evaluates web pages and recommends solutions to pick up their performance on the basis of certain rules for high-performance pages. Yslow categorizes a web page, review its mechanism, and exhibits information about the page. 7. Benchwarmer: Benchwarmer is a Chrome extension for a site named Dribble, which is considered a haven for designers to showcase and endorse their dramatic designs. Each time you enter a new tab, Benchwarmer exhibits motivating images, from your popular images or feed. 8. Palette: Want to craft a color palette that idolizes an image? How about clutching some colors for amusement? With Palette at your corner, all you have to do is right-click on the intended image, choose the “Palette for Chrome” option, and select the number of colors you yearn to have for your palette. 9. Instant Wireframe: This spectacular Chrome extension permits the user to observe any web page by the means of a wireframe overlay. 10. Dimensions: It possesses traits of a design tool to determine screen dimensions. Dimensions aid in deducing area boundaries, images along with HTML elements, buttons, videos, text, and icons to complete the list. It is considered exemplary for evaluating mockups. Cactimedia has a splendid knack of offering the plethora of expert website design solutions complemented with applause able advice. The surplus web design features dished out by Cactimedia gives you an insight about the most appealing website design methods and techniques in Dubai, you would love to know.